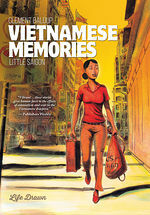 Vibrant. . . . these stories give human faces to the effects of colonialism and war in the Vietnamese diaspora. 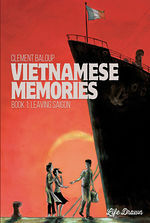 "Evocative, sad and enlightening, Baloup’s work should hold widespread interest..."
"It is often interesting and useful to look at Asia through a non-English, albeit still Western eye. 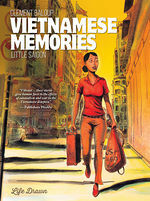 Leaving Saigon does not disappoint." "Altogether, a great book that pushes the boundaries of storytelling and remembers that true stories are sometimes more interesting than fiction"
A beautiful looking little book that punches above its own weight in terms of historical value. "This type of graphic novels help us talk about war and its consequences, they open roads of understanding, and I think they are very necessary indeed." The authenticity of these collected memories compels us to become truly haunted and touched (even gut-punched!) by the fate of these five witnesses. The stunning colors illuminate the souls of each individual immigrant, to whom we become quickly attached. We know personal stories, told by the father to his son, by the old man to the promising youth. Once again the recipe is perfect, thanks to the author’s subtle art and discreet style of telling stories, mentioning the worst with dwelling at length on it and giving each reader a chance to remember (or to imagine for the youngest). You need to read it, to become aware of a little-known historical reality and to follow and to discover this highly talented young author.